Mark Burns-Williamson (Labour) won a second term as West Yorkshire's police and crime commissioner. In the first round, Mr Burns-Williamson narrowly missed gaining half of the votes, getting 49.67 per cent. Local election Day is Thursday 5 May this year. Each ward is representated by three Calderdale councillors. On 5 May, we have the opportunity to vote for one of them. The candidates are listed below. As with previous elections, the HebWeb has invited candidates to post messages here on why we should vote for them - up to 500 words with photo. So far, we have a received a responses from Jenny Shepherd, the Green Party candidate, Cllr Janet Battye, the Liberal Democrat candidate and Josh Fenton-Glynn, the Labour Party candidate. The HebWeb looks forward to receiving responses from the other candidates. See below for their statements. Jenny Shepherd has lived in Hebden Bridge for nearly 23 years, raising two children and working as a bookseller, writer and screenwriting lecturer. She is actively involved with local groups that work for peace, environmental, social and economic justice, and to save the NHS from cuts and sell offs. 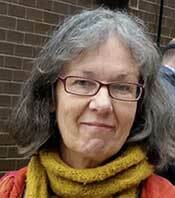 Jenny said, "Greens work with anyone we have common ground with, in terms of policies and philosophies. We're not into tribal party politics. "On Calderdale Council, Greens would support policies and projects that increase social, environmental and economic justice - regardless of which party put them forward. And we would oppose policies and projects that would send us further down the path to greater social divisions, unfairness and environmental destruction. "We already work hard outside the formal political system, for social, environmental and economic justice. "Think what more we could do with Green Councillors on Calderdale Council." Greens advocate that Calderdale Council puts climate change at the top of the local planning agenda. Jenny continued, "We urgently need to start living on the basis that we have only One Planet, and the local plan is key to that. Without this, plans to reduce and mitigate flood risk will be largely futile, since climate change is the reason why devastation "100 year" flood events are now occurring every few years." Jenny also advocates increasing public spending - instead of cutting it - via the use of prudential borrowing, in order to invest in public services and offset the central government funding cuts to Calderdale Council. "We need to work towards a greener, fairer Calderdale. Investing in green infrastructure and natural flood alleviation schemes, new social housing and welfare support would put money into the local economy and cut the costs of high energy bills, flood damage, and poverty and deprivation. For every £1 of public spending, further wealth is generated in the economy as that money circulates. Let's put that money into the local economy." Jenny is worried that one fifth of Calderdale children live in poverty and the area has high levels of social and economic deprivation that translate into poor health and reduced life expectancy. This urgently needs tackling. She said, "We need to stop the proposal to cut hospital services and replace them with poorly - resourced care in the community - this is nothing more than cuts dressed up as reforms. NHS cuts and sell offs are speeding ahead with the new so-called "Sustainability and Transformation Plans" and Vanguard schemes. "These Care Closer to Home/ Vanguard proposals say prevention of illness is one of their aims - but when you look at the schemes, you see they're about pushing for behaviour change by people who are in poor health because of obesity, respiratory illness, heart problems or diabetes. Truly preventive public health measures would get to the root of these types of ill health: the problems with our food industry, the problems of air pollution, the lack of walkable and cyclable transport routes, the problems of "austerity" that damage people's mental and physical health." Jenny also totally opposes the forced academisation of schools. I have been privileged to be one of your Councillors since 2002. In that time, I have tried to work hard to get to know people so that I can help and represent your needs, views and concerns. I would like to continue to do so. Flooding: I want to both make sure that repairs are completed and that longer-term prevention and resilience work is done properly and involves us all. I am a member of the Council's Flood Commission and Flood Strategy Steering group (which should meet in public). Local and Neighbourhood Plans: these are now well underway and I want to make sure that the greenbelt, our lovely moors and hillsides, are protected and that any new houses are built where we want them. Care Closer to Home: This should lead to more health and social care services based in our Health Centres in Hebden Bridge and Todmorden making it easier for people to get help and advice so that GPs are available when we need them. But, above all, I will continue to live locally, to hold regular ward surgeries, walk around and talk with people. I was born and grew up in Midgehole, Hebden Bridge and have lived here for most of my life. I'm asking people to vote for me in the local election because I will be a strong voice for our area and I'm determined to never stop fighting for my community. We have seen the damage done by two Lib-Dem/Tory coalition councils in the past few years and really need a Labour council that stands up for everyone in Calderdale. And a vote for Labour in this area could make that difference. The Boxing Day floods hit our community hard. But helping out in the following days, I was so proud of our community spirit, and determined that must do everything we can to stop future floods and build our resilience. From region-wide river management, ensuring responsible land management and building protection into our homes and businesses. I'm proud that the current Labour council put a £3 million flood resilience fund into the Calderdale budget, and disappointed that this was not supported by the sitting Liberal Democrat Councillor, who abstained from the vote in 2016 and in February 2015 voted against flood resilience funding altogether. This government have announced they want to make all schools academies. This is undemocratic and completely uncalled for. It is a move I strongly oppose and a Labour council in Calderdale will fight hard against it. Academisation leads to a lack of local control and makes it more difficult for schools to work together in purchasing and employing common teachers across more than one school. I have a proud record of standing up for Calderdale NHS. I campaigned to save our A&E and I will continue to fight to stop other services being moved further away from our community. The case for combining A&Es has simply not been made and we must be clear that we need urgent care at both Huddersfield and Halifax hospitals. I also believe we should be campaigning for more out-patient services to be available closer to home - including at the Todmorden health centre. I will work extremely hard for this community, and will have an open door for anyone in the area who needs the support or advice from their Councillor. I will hold regular surgeries for residents to to bring up any issues or concerns you have, and I'll be out and about to find out your views. I will listen to what you need from the council and will be a committed and energetic advocate for this community and will follow through on my promises. HebWeb News: 2015 Calderdale Council Election - Results and candidates' statements for Calder and Luddenfoot wards.